James H. Winston, one of the First Coast YMCA’s most passionate supporters, passed away Wednesday, September 19. 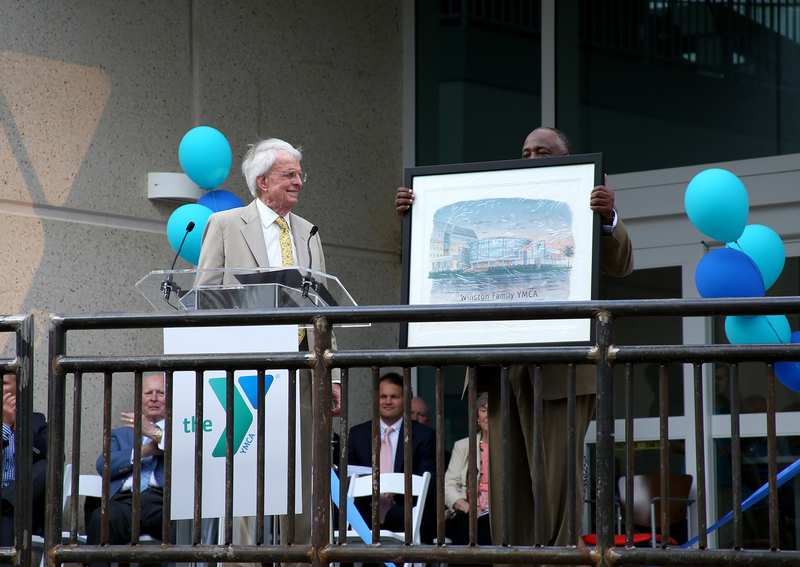 Mr. Winston cared deeply for both the Y and the city. He really understood the impact the Y has on the community. That’s what drove his involvement in the Y’s important work for more than 50 years. 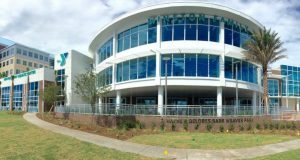 “How incredibly fitting that Jim’s name graces the Winston Family YMCA, a place that’s welcoming to all and serves as a shining example of the good that can happen when a community comes together, said Eric K. Mann, First Coast YMCA President and CEO. 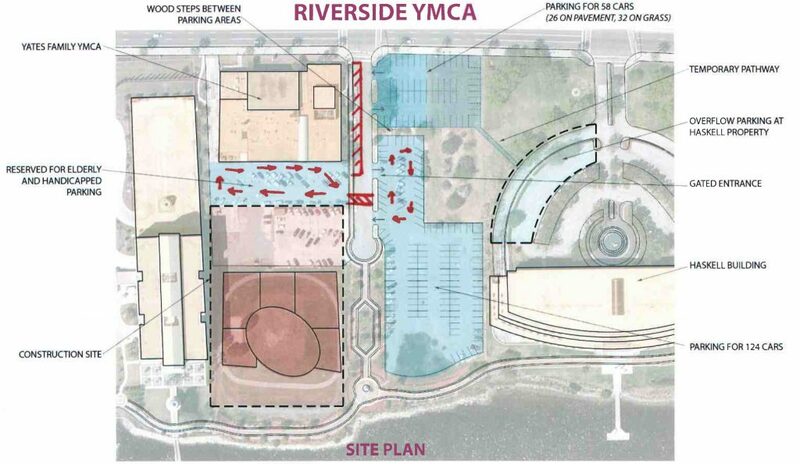 UPDATE: Construction is on schedule for the new Winston Family YMCA in Riverside. We are looking forward to a late summer 2016 opening. Below is a live feed showing the progress in real-time. The parking lot behind the Yates Y will have a temporary access drive to allow for accessibility parking and drop off/pick up only. There will be only one way in and out and arrows will be painted to indicate this. Parking will be available in the lot across the street from the Yates Y and in an overflow lot at Haskell. A pedestrian walk will be available for crossing over Jackson Street. To ensure the best experience possible, additional signs and painted arrows will indicate flow of traffic. Also, road flag workers will be on site daily to help direct traffic. Please follow all posted parking and pedestrian detour signs and other notices regarding construction activities and safety information. As we learn of any parking changes, we will update this information as soon as possible. As always, if you have any questions or concerns, we are happy to help in any way we can. On a fundraising goal of $21M, we only need $2.5M, but we’ll need YOU to help us cross the finish line! To help us make a difference, contact Nekita Nesmith at nnesmith@firstcoastymca.org. The construction of the new Winston Family YMCA in Riverside is moving ahead on schedule. Last week, a group of our donors, board members and Y leaders along with our construction partners took the first hard hat tour of the construction site. The first wall went up on October 6 and we are looking forward to a late Summer 2016 completion date. We are also getting closer to our fundraising goal of $21M. We only have $2.7M to finish, but we’ll need YOU to help us cross the finish line! To help us make a difference, contact Nekita Nesmith at 904.265.1812 or nnesmith@firstcoastymca.org. Naming opportunities for the new Winston Y are still available. Checkout some of the photos from the tour! [WRGF id=27762] ICYMI: First Coast Magazine featured the Yates Y in this month’s Unmasked edition. The construction is going really well, so we took a video so you could see the progress so far! First Wall up at the New Winston Y! 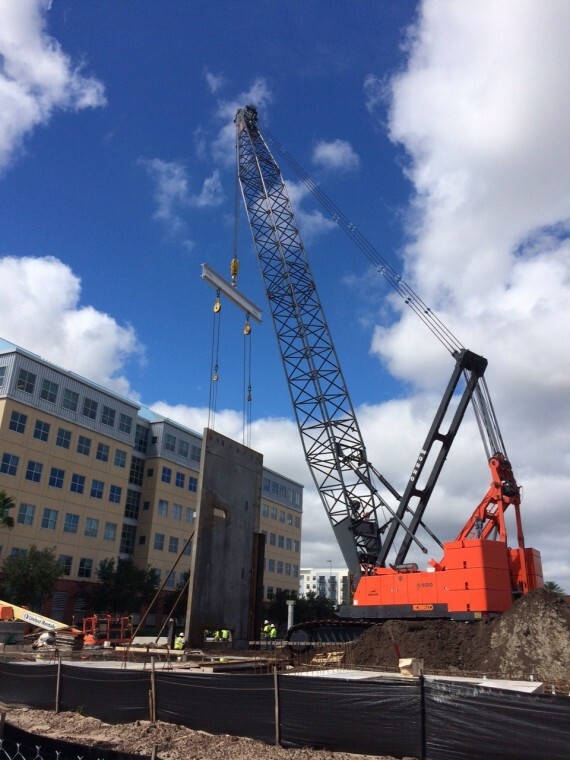 The first wall is now up at the site of the new Winston Family YMCA in Riverside!!! We are looking forward to opening the new 72,000 square foot facility in late Summer 2016. We are grateful for the generous donors who are supporting our efforts. The new facility will be about 8,000 square feet bigger than the current one, which was built in the 1950s. The fitness area will be 12,000 square feet, twice the size it is now, and will have an indoor running track above it. The indoor lap pool will be 25 meters long with six lanes, as opposed to the four lanes and 25 yards it is now. A second, warmer pool will be for children’s swim lessons and senior citizens classes. The women’s locker room, which is now much smaller than the men’s, will be increased to be the same size. There will be a cafe in the lobby and two “spiritual wellness” centers for prayer, meditation or just a quiet place. 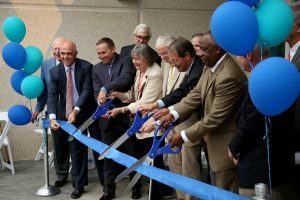 The Luther and Blanche Healthy Living Center in the Y will be open to the public and include Florida Blue, Baptist Health and Brooks Rehabilitation. The Jacksonville Jaguars Foundation pledged $500,000 to name the gymnasium in the new Winston Family YMCA and continue its support of the Willie Galimore Community Center pool in St. Augustine. 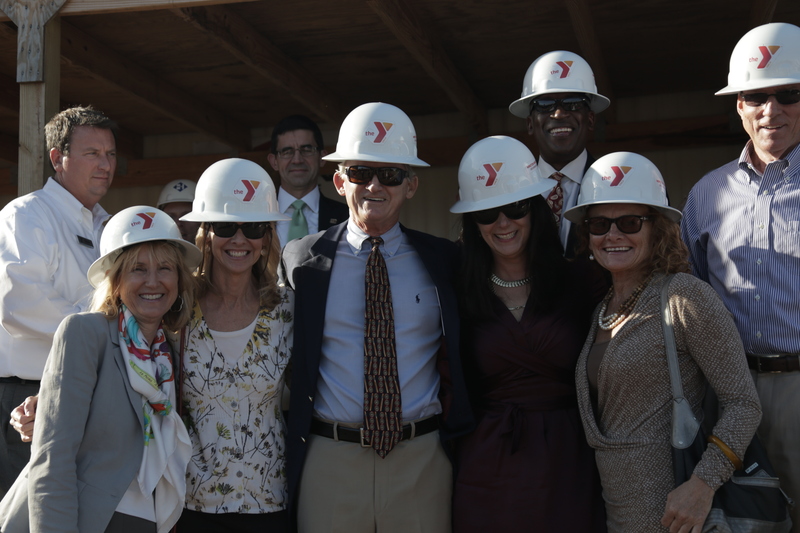 Programs and activities offered at the gym in the new Winston Family YMCA will contribute to the YMCA’s goal to provide new and innovative opportunities for youth by directly impacting 5,000 Westside, Downtown and East Jacksonville children through healthy habits curriculum. 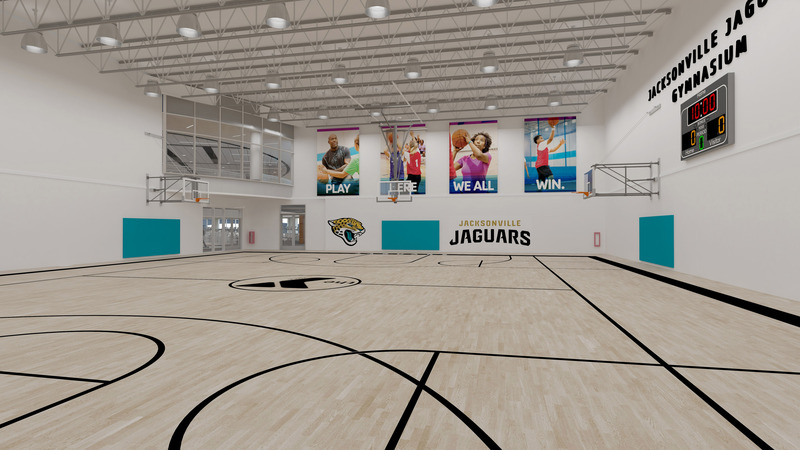 The Jacksonville Jaguars Gymnasium will be a 7,800 square foot indoor gym featuring a full basketball court, two short courts and one volleyball court. It will be open year-round and will host youth, adult sports leagues, as well as open gym games, and other programmatic offerings such as group exercise and child care activities. This gift will also continue The Jaguars Foundation’s support of the Willie Galimore Community Center pool, which is operated by the the St. Augustine YMCA. Since 2013, support from the Jaguars Foundation has allowed the Y to waive pool entrance fees for all guests and extend the pool’s hours. The Galimore pool serves nearly 4,000 swimmers in St. Augustine every year. In addition, the Y has provided swim lessons to more than 500 children at the Galimore pool over the last three years. The new Winston Family YMCA is on schedule to be complete in August 2016. Naming opportunities are still available. For more information, contact Eric Mann at 904.265.1780 or emann@FirstCoastYMCA.org.